After over a year of linking up most weeks, this is going to be my last regular link up to #wickedwednesdays. I have loved linking up, sharing my “real” parenting photos and having a giggle at some of the other photos linked up. However, Freyja is growing up and actually providing few stroppy pictures and there are only so many photos I can share of Emily with chocolate round her face. 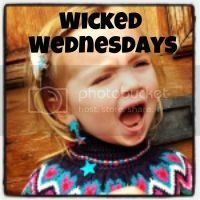 That’s not to say there won’t be some #wickedwednesdays photos in the future, but there won’t be a weekly instalment from me any more. So, what better way to finish than with a photo of my beautiful girls….. Both in shot – check! They are my little cheeky monkeys!